Magazinzoo.com Reviews Do Animals Smile? Our smiles are just one of the expressions that set us apart from the rest of animal kingdom. Or are they? Do animals smile? Humans pull many facial expressions – excitement, sadness, happiness and anger for example. They are formed when our brain moves the muscles in our faces in different ways. It feels good to smile and it’s our favourite expression to see on others too. Many people believe their pets smile at them but how much if this is real and how much is simply our projection onto that animal? 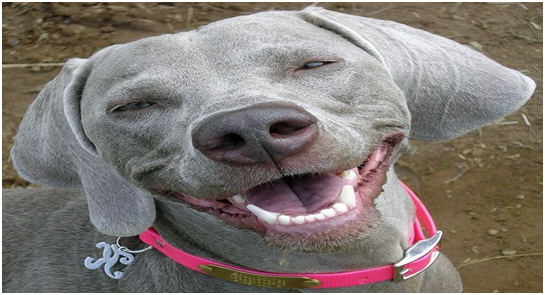 We’ve all seen our own pets or images on the internet of animals who appear to be smiling. Perhaps you notice your dog’s mouth turning up at the edges when it’s playtime or time for dinner? Are those expressions coming from emotion or are we imagining things? The closest animal to humans in terms of facial expression is the chimpanzee. They are often seen flashing big cheesy grins when they are playing together or looking for attention from humans. Whether this is done through happiness or a learned behaviour they think we respond to is still the subject of investigation. Up until quite recently, those who studied animal behaviour believed that what we see as a smile in an animal is little more than conditioned reflex moving muscles in the face. New theories are now looking into the fact that animals could well be expressing happiness when they pull this expression. Some forward-thinking experts are even suggesting that all primary and some secondary emotions are experienced by animals – including jealousy, fear, sadness, embarrassment, happiness and anger. We’ve all seen the cat or dog that seems jealous of a new baby in the house for example. Experts think that we have for too long underestimated the emotional range and intelligence of many animals. Some even believe that dogs display a sense of humour and let out a short exhalation that sounds a bit like a human laugh. Stress levels in dogs have been studied and found to decrease in animal shelter dogs who were played a recording of that breathy dog sound. It’s hard to tell with our pet felines, who have naturally upward curving mouths anyway. Most cat owners would tell you though that they are smart enough to appear content when it suits them but sensitive enough to show you some love when you’re feeling down. Perhaps they are smiling as most cats have much to smile about.